No suspects, but police "don't believe it was a random act"
(CNN) -- When the Connecticut Huskies take to the field to play West Virginia on Saturday, their helmets will carry the initials of cornerback Jasper Howard, who was stabbed to death over the weekend. The incident happened at 12:33 a.m., shortly after a sponsored student dance on campus. "It'll be good to get on the practice field tomorrow," UConn head football coach Randy Edsall told reporters Monday. Asked whether the team considered postponing the game, he said, "I know Jasper wouldn't want us to do that. I just know that." Howard, a 20-year-old cornerback who started in every game for the team last season, was killed in a fight after a student dance on campus Saturday night, authorities said. Edsall said two other UConn players were with Howard at the time of the incident, but declined to identify them. On Monday, the Connecticut Office of the Chief Medical Examiner said Howard died of a stab wound to the abdomen. The death has been classified as a homicide, said Bill Farrell, an investigator in the medical examiner's office. The incident happened at 12:33 a.m. Howard and the other victim were taken to a local hospital. Howard was then airlifted by helicopter to St. Francis Hospital in Hartford, where he later died, police said. The second victim, who was treated and released, was 19-year-old Brian Parker, a redshirt freshman on the UConn football squad, according to CNN affiliate WTNH. Johnny F. Hood, 21, was arrested in connection to the fight -- not for the stabbing -- and charged with interfering with an officer and breach of peace, according to a police report. He was released on $100,000 bond. Hood's attorney said his client was simply at the wrong place at the wrong time, WTNH reported Monday. 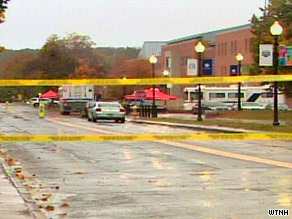 UConn police and the Connecticut State Police are investigating the incident. They don't have a suspect in the stabbing, but they "don't believe it was a random act," Blicher said. Both students and nonstudents were in the area at the time. Authorities are investigating whether alcohol was involved and what the altercation was about, he said. Anyone with information is asked to contact UConn police. Howard, a father-to-be, was a cornerback for the Huskies, who are 4-2 this season. The team's Web site says he started in every game last year and led the Big East conference in punt returns. On Saturday, the Huskies beat Louisville 38-25. Howard was awarded the game ball after the game, Edsall said. Howard's mother, Joangela, said her son called her after the game, which she watched from her Miami home. Just hours after that chat, she received another call from Edsall, who told her Howard had been stabbed. "He was a good child, a wonderful, sweet, loving child," Joangela Howard told CNN affiliate WSVN. "I just hope whoever did it turns himself in. [Jasper] didn't deserve this." Edsall said Howard's family would be arriving in Connecticut Monday afternoon. CNN's Gabriel Falcon contributed to this report.